Have you seen anything more beautiful? Michael Kors just introduced their new Limited Edition Runway Watch that was inspired by Paris. I’m excited and honored to tell you that I was chosen by the Michael Kors team to be one of a few select online influencers that is involved in the social media campaign to announce the watch. This is truly one of those rare pieces that is meant to be treasured and passed down as an heirloom. There are many ways I would personally style the watch. I envision wearing it with an equally glamorous outfit that would be comprised of a white feather dress and black heels. The white feathers would really make this lovely rose gold watch stand out. The white would also match the dial which is embellished with a 2.5 mm diamond at the number-12 index. The watch is valued at $650 and there were only 2,000 made. Luckily, Michael Kors is giving away the first 3! 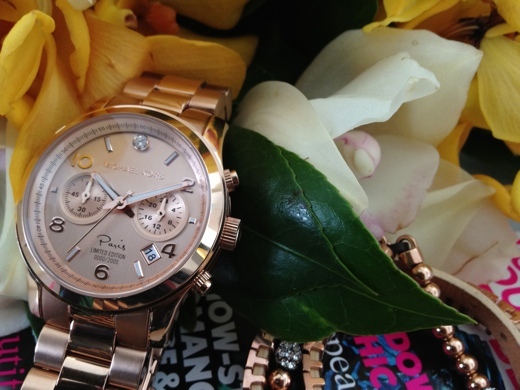 Here are the rules to win one: Love your Michael Kors watch? Show us how you wear it! Share your photo on Instagram with the tag #MKTimeless for a chance to win the Paris Limited Edition Runway watch. *Click here for the full Official Rules. I wouldn't mind producing a post or elaborating on a number of the subjects you write concerning here. Again, awesome web site!